The Reverend Rees’s response to the Bundred Report into the council’s MULTIPLE FINANCIAL FAILINGS, being personally overseen by his chronically underperforming donkey of a new Chief Exec, Anna “Big Wedge” Klonowski, is FALLING APART before it’s even started. So come Thursday and Ms Klonwoski’s incompetent legal boss and Monitoring Officer, Shahzia “Dim” Daya – who personally oversaw and signed off the UNLAWFUL BUDGET of 2016 at the heart of the controversy – published her own report to councillors, ‘Scrutiny Structures and New Ways of Working – Hothouse Outcomes’. So much for “the need for REPORTS rather than PRESENTATIONS to be used as the basis of discussions and decisions” then. Do the new rules not apply to lazy and bent Monitoring Officers? 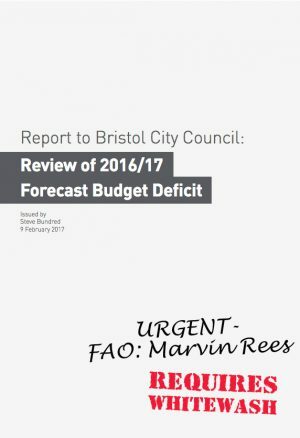 The significance of all this is that councillors simply did not have the necessary ACCESS and INFORMATION they required to scrutinise what their bent managers were up to in 2015 – 17. This new scrutiny review is supposed to correct that. Although it looks to us like councillors are being blatantly set up to fail all over again by exactly the same council bosses who conned them last time. This entry was posted in News and tagged Anna Klonowski, Bristol City Coucil, Bundred Report, Chief Executive, Head of Legal, Marvin Rees, Monitoring Officer, Overview and Scrutiny Commission, Response to the Bundred Review, Scrutiny, Scrutiny Structures and New Ways of Working – Hothouse Outcomes, Shahzia Daya on May 12, 2017 by thebristolblogger. So is Shahzia Daya part of the SLT (which agreed to written reports) or is she incapable of following SLT policy (in which case she should be looking for a new job). Where did she get transferred from and what extortionate salary does she rip us off for? Was there a big fat agency fee for bringing in this rubbish? Why does Bristol always get the dregs for top brass? Never learn from past mistakes? Over and over again. Those with long memories might recall Ms Daya’s role in 2010 with the infamous “coconutgate affair” in which then LD councillor Shirley Brown called a Conservative colleague a “coconut”. Ms Daya was the council officer who investigated the subsequent complaint, stating in the whitewash report into the matter: “although the term ‘coconut’ undeniably has a racist element to it, its use in this particular context does not constitute racial abuse“, for which alone she should have been sacked all those years ago and saved Bristolians wasting council tax on her salary.